For our next challenge we will be exploring Adult Obesity in the United States data from 2017/Week 41 of the Makeover Monday Challenge. Consider what does and does not work well with the original visual, and how you might improve the visual. The goal of the challenge is to renovate the visual. This could mean improving the visual, or revealing a different story. Participants may use Tableau or any other data visualization tool (Excel, SAS, R..) to create their visual. 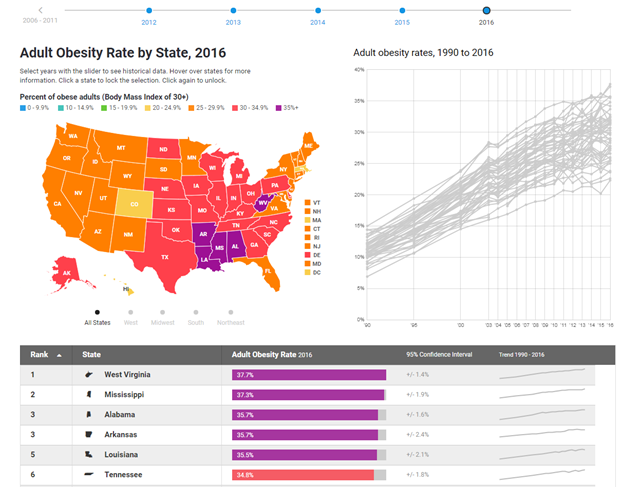 Here is a link to the data set, from the CDC, and original visual from https://stateofobesity.org/adult-obesity/. Submit your entry by responding to this discussion. You may submit as many visuals as you like. Each participant will only be entered into the drawing once. You may update your submission at any point. If you have questions/comments while creating your visual, post your questions/comments here! To ensure your visual is shared at the next TUG, your visual must be posted to this discussion by 5PM EST on October 8th. I grouped States into regions, then pulled out States from the region with the highest percentage. The color coding indicates how percentages have changed over the years. 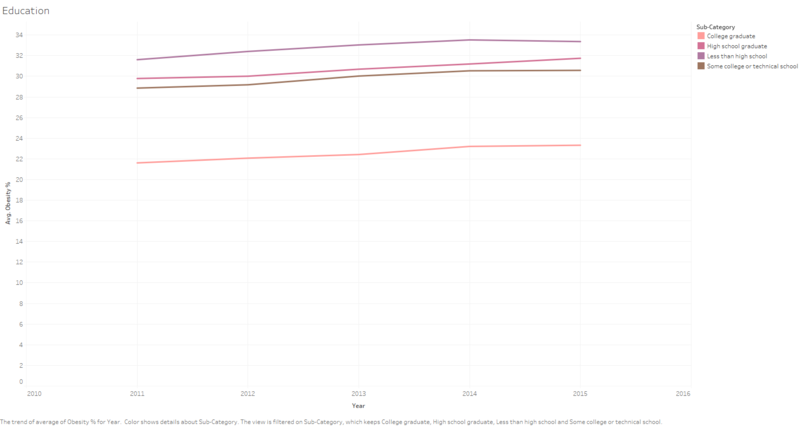 I made graphs using the 2011-2015 data that shows obesity trends for the national average for different sociodemographic factors ; age, education, gender and income. It is interesting how age ranges 35-44, 45-54, and 55-64 have the highest averages, but for the age range 65 and older the average decreases substantially. It would be interesting to see what other factors contribute to this. I would like to upload the twbx files. Slider on the Category so you can toggle which demographic interests you. @srfogel nicely done! You can easily distinguish which States and age groups have the highest percentage. Agreed, the ability to upload twbx files would be great. For now, you could upload your workbook to your Tableau Public profile (if you have one) and post a link to it. Now able to upload the packaged workbook. Try the slider. Attached is the PowerPoint from today's meeting. Congratulations to @Seif our challenge winner! 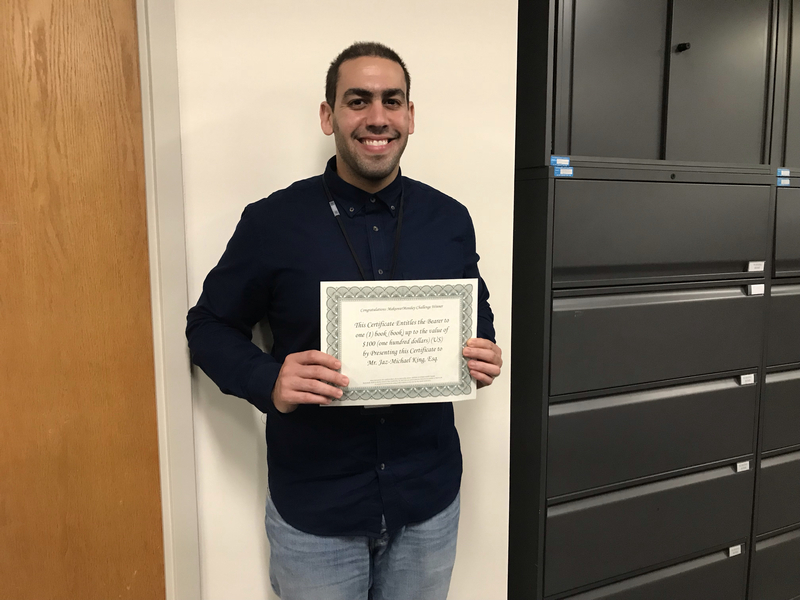 Below is an image of Seif with his certificate. Thank you @srfogel for participating! I just wanted to try out this challenge myself. 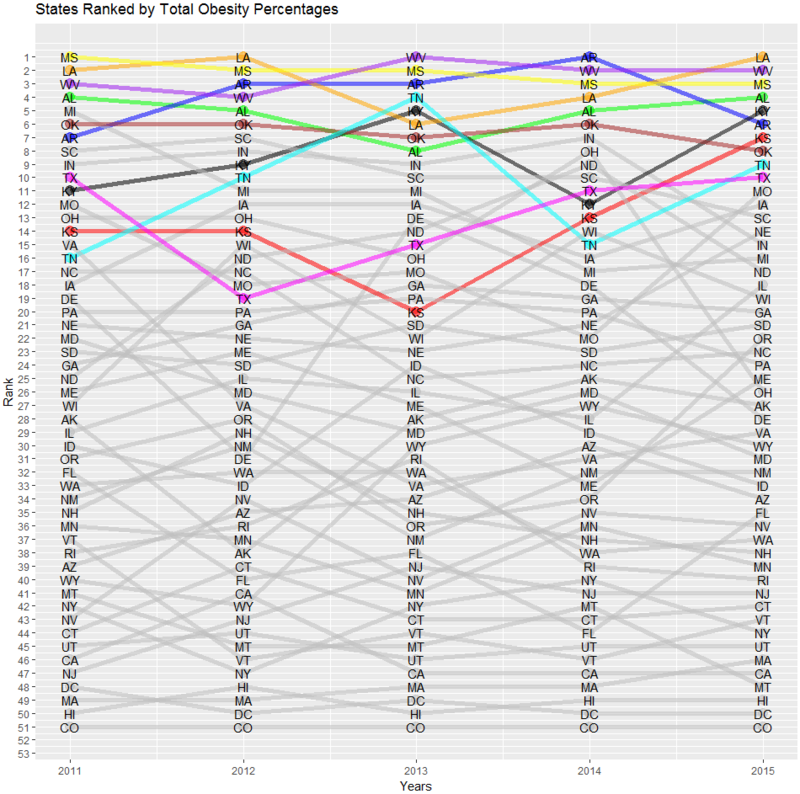 I thought a bump chart would be informative in terms of ranking the states by obesity rates over the 5 years to see how states compared against each other. It was already evident in the original visual that all states were seeing an increase in obesity over the years. Also I limited my chart to look at only the 50 US states, not the US protectorates or the US capital that was in the data. 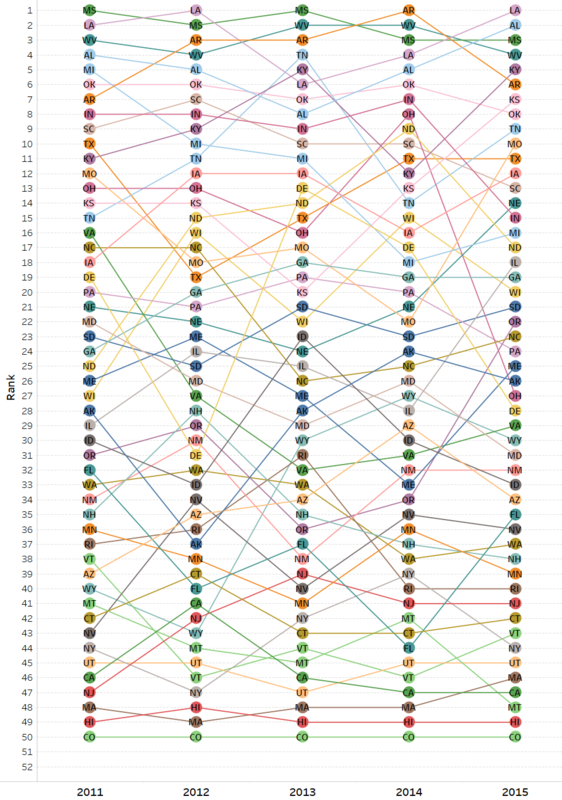 One limitation with bump charts that I saw was in assessing how to rank states with equal percentages or competing rank. 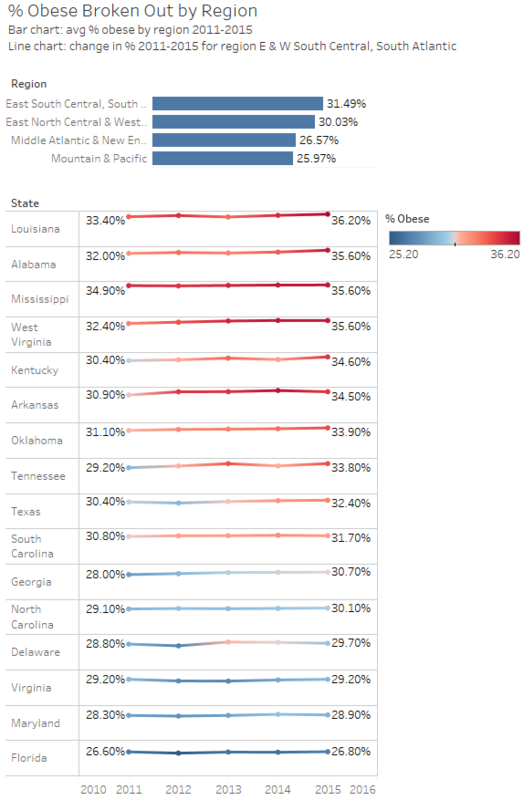 I like to attempt using different tools, so I tried this method using Tableau and R. Spoilers - Using this chart, one can see the majority of the top states for highest obesity rates were mostly southern U.S. states. Maybe a label of some sort to highlight this finding in the vizzes might have been useful if the viewer is not aware of the regions of U.S. states. Feel free to comment or come by and assist me or view and think what I could have done instead. 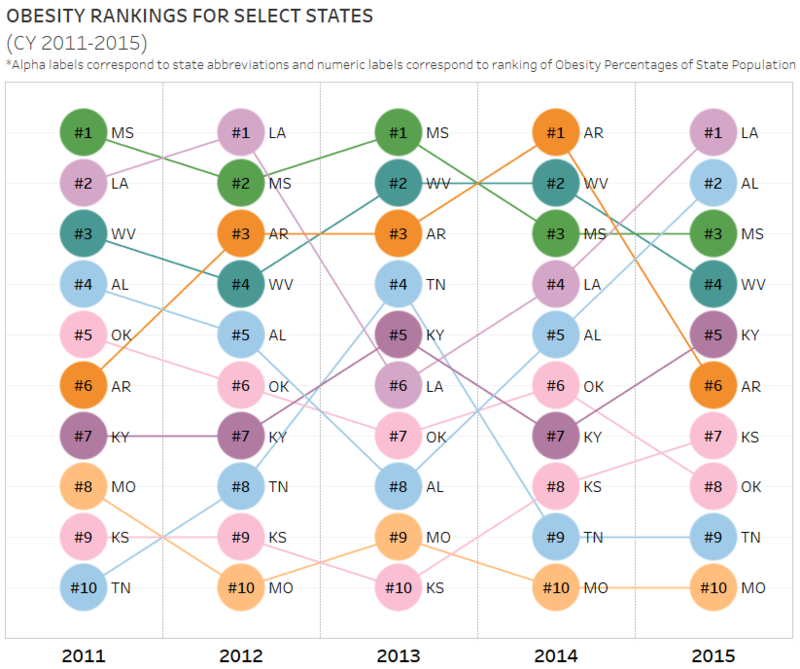 For the R visual, I try to highlight the top 10 states for obesity rankings in 2015 by keeping them in color across years, while keeping other states in grey as they are not my focus; however, I was unable to replicate the same effect in Tableau with my dual axis setup. 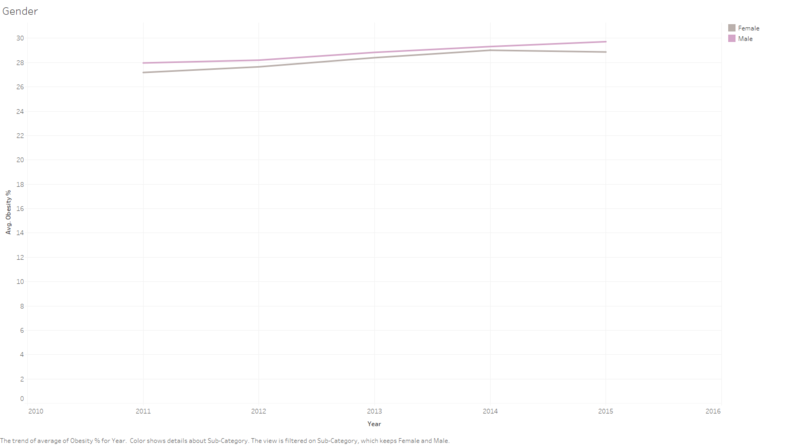 You can tell Colorado had the lowest obesity rates amongst the 50 states for 5 years. Decided to limit my rankings and analysis to the top 10 states for 2015. 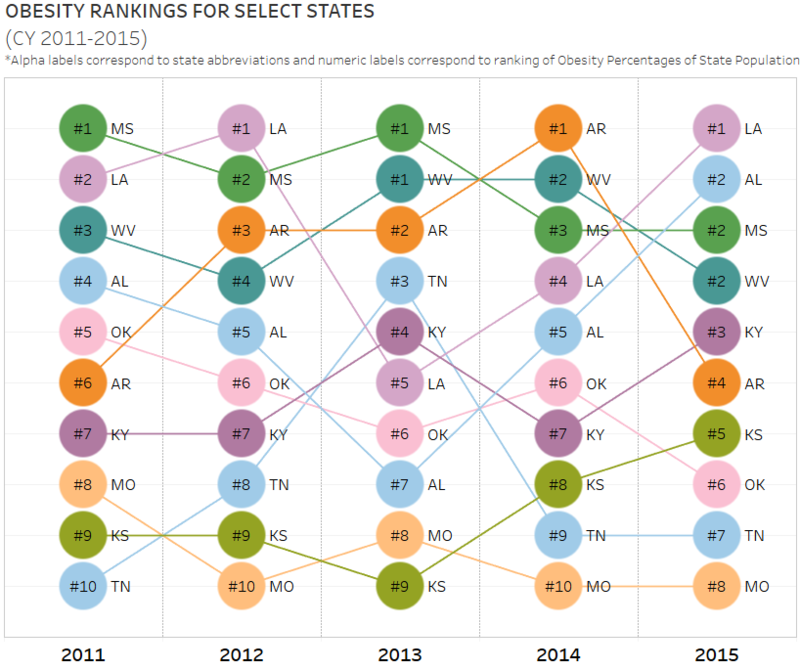 Can see from the viz below, that Mississippi had the highest obesity rate in 2011 at the #1 spot of the 10 selected states and Louisiana had the highest obesity rate in 2015. 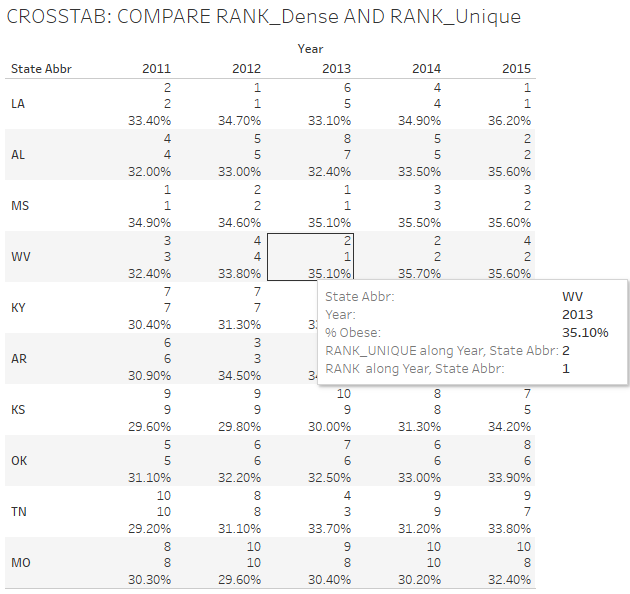 Update 11/8/2018: Although a 'unique ranking' was useful for setting up the viz, it wouldn't be right to prioritize one state over another as #1 when the rate for both states were the same, therefore I labeled the Tableau ranks for the select states using a 'dense ranking' label. Also I adjusted the color for Kansas (KS) as it was too close in color to Oklahoma (OK). 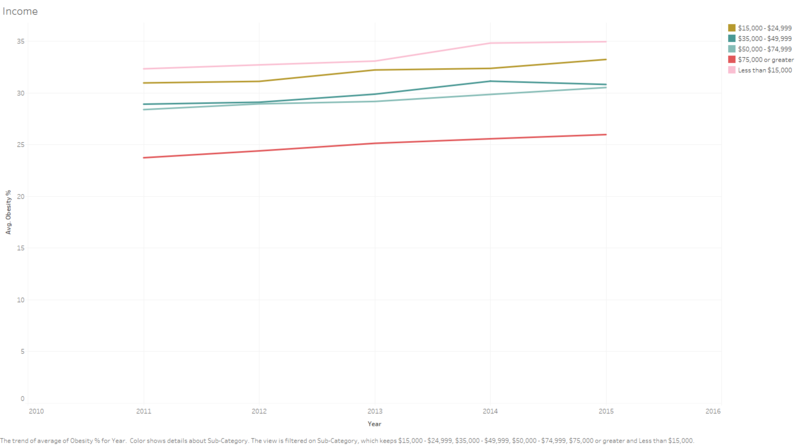 @Sybil_D It's great to see the comparison between R and Tableau. Highlighting the top 10 in R draws the viewer to the point of the visual. 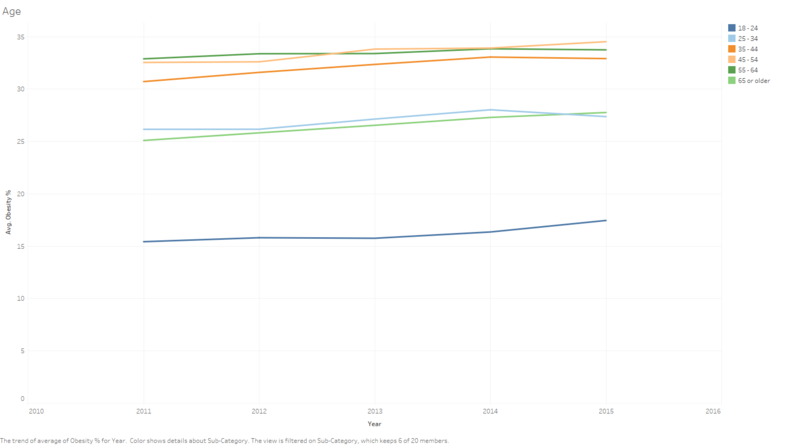 In Tableau, the Cross Tab is a nice addition to add further explanation to your visual. Awesome job using R! Have you posted your code anywhere? It could be useful to have a codeset library so that we can share code with one another.